Earlier this year, I read this post on local foodsheds, and got to thinking that there must be a good way to automate and generalize this type of analysis. So I put the idea into the big bucket of ideas that I don't have time to implement, until it came up in a conversation with Brent Pedersen. He mentioned a great way to optimize the raster summarization that I hadn't thought of, so we got excited, and put it into the bucket of ideas that we'd like to implement (but probably wouldn't). Until finally, a few weeks ago, we decided to get together for a Sunday hackfest. A few hours later, with a good percentage of my time wasted learning the strange ways of git, we had a functional demo that summarized NLCD data by class for any given buffer or polygon, in a simple Django framework. To get things vaguely useable, we added a pie chart to show the classified summary, and integrated some census data to get the population. Our initial demo is now at landsummary.com. Maybe next week we'll have time to give it some User Interface love. In the meantime, I'm really happy with how fast the open source stack we used let us get this type of interactive analysis online. For the record, we're using GDAL, Numpy, et al for the raster analysis, PostGIS for census and other vector data, Django for the web framework, OpenLayers for the map, and MapServer/TileCache for the NLCD tiled map overlay. It really says a lot to me that with a surprisingly minimal bit of code we were able to get the basic demo online, let alone in such short time. Over the last week we've also added some hiddenish features that we will probably expose in an API, and started some example analyses to help show not only how these types of summaries can be used to visualize patterns in foodsheds, but also that I'm capable of posting to this blog more than once a month. If you have any ideas for additional datasets you'd like added (topography, census SF3, and detailed historical weather station data are already en-route), let us know. I had a great backpacking trip in the Southern Sierras (near Mt. Whitney in the John Muir Wilderness) a few weeks ago, and finally decided to see about getting some geocoded pics online. Note: the time offset (in seconds) is because my camera and I are set to -8 hours from GMT, and the time diff allows my photos to be up to an hour off from the closest gps point. This is because I sometimes hiked with with the gps off. Now that the photos were geocoded, I uploaded them to Flickr, and noticed they weren't automagically put on the map, because I had never enabled Flickr to accept geocoded Exif headers. Easily solved. Next, I wanted a nicer KML of my actual route. For this, I used the GPS plugin for QGIS (requires GPS Babel), which made importing directly from my garmin surprisingly easy. QGIS rocks! After a little bit of editing/smoothing of my line, I used ogr2ogr to convert the saved shapefile to a kml. Finally, I wanted my KML to show photo links as well. I was thinking I would make a little Yahoo Pipes thing to get my KML from a photoset, but it looks like the lazyweb already took care this for me, so all I had to do was copy the resulting points into my route kml, and I was done. I finally had a chance to get my first flight in at Mussel Rock earlier today -- soaring over the coast was everything I had hoped for. No need for a vario at this place; lift is everywhere. So much lift, that when I was ready to land, it took judicious use of big-ears (which is very common to see out here, and clearly helpful to ensure you avoid blow-back) to get past the incredible buoyancy I was getting. I have no idea why some folks call it cliff-boring .. soaring is a ton of fun, and it's great to be a little more familiar with this site. Ate lunch at Eric's today. Despite their scary restaurant inspection report (EveryBlock reports are yet another nice feature of San Francisco), it was one of the better meals, and deals, I've had in a while. $6.50 total bill for a huge plate of tasty kung-pao goodness, soups, and tea. I'll be eating lunch here again. I spent the morning at Mussel Rock Park, kiting and getting back up to speed on some ground handling basics with some good tips, and a great site overview from Jeff of Airtime San Francisco. 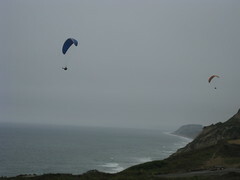 I've never gone cliff soaring before, and I'm certainly not used to the fog! Starting around noon, there were a few gliders in the air, and I understand the weekends can be packed. If the weather looks good, I'm excited to get some flying time in early next week. When I first saw walkscore.com I was impressed with their simple but clever approach to creating a walk index. Ranking walkability is an interesting topic for me: I've had the opportunity to work on a few different sprawl and walkability models in the past, but these often tended to be complex. And I don't mean they used tricky or especially unintuitive algorithms (although do believe this type of analysis is often ruined by unintuitive modeling). I mean complex in terms of the data sources. In the world of ranking walkability, many sources (assessor, zoning, sidewalk attributes, etc) that the more academic models tend to rely on are just not comparable from city to city. To me, one of the key features of the new version of walkscore is that it keeps true to it's initial approach by keeping it simple (business listings and census data), and using a straightforward methodology. By focusing on amenities and where people live, can a model like this be used as a proxy for walkability? Or, perhaps more accurately, for don't-need-a-car-ability? I think so, but check out the rankings yourself. Of course, I might be biased, since I did have the opportunity to assist with the analysis and visualizations (which turned out to be a truly fun project -- thanks Matt and Jesse). If you have any questions on the methodology, be sure to stop by the FOSS4G conference later this year, where I'll be giving a talk on some of the methods for data acquisition, analysis, and integration of heatmaps. A long time ago, I decided I should really start a blog. But hey - it takes some effort. I think. I put it off, promising myself I'd start one as soon as I moved out of Seattle. Until recently, it seemed like I might never have to deal with this first post, let alone come up with a blog title. But, thanks to Deema (and her job at YouTube), here I am. I won't bore you with details on our move, which was fairly straightforward. One important piece of information I can confirm: drugging cats before bringing them on a long car trip is a very good idea. Now that I'm getting settled in, I'm excited to start to take advantage of the local tech entrepreneur scene. With any luck, some near-future post will be on the start of a SFUGOS group (in the line of FRUGOS and CUGOS).